"I'm Mr. Meeseeks. Look at meeeeeeeee!" 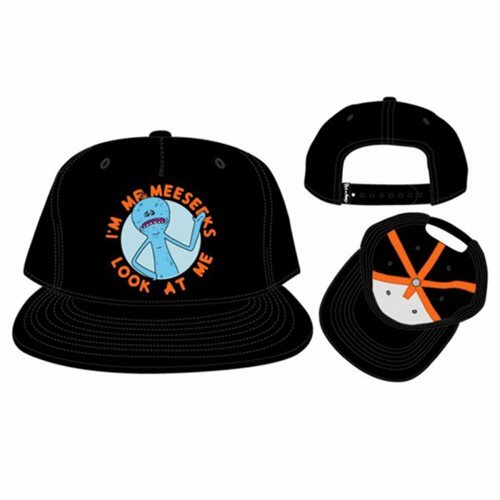 (poofs out of existence) This Rick and Morty Mr. Meeseeks Snapback Hat won't open a mayonnaise jar, take two strokes off your golf game, or disappear… but it will protect your noggin from the harsh rays of the sun. The black acrylic wool cap has an embroidered Mr. Meeseeks applique on the front, plus "I'm Mr. Meeseeks. Look at Me" in orange block lettering. Hand wash cold, lay flat to dry. Ages 14 and up.